Governor Ayodele Fayose of Ekiti has reacted to news that Nigeria was out of recession describing it as inaccurate. 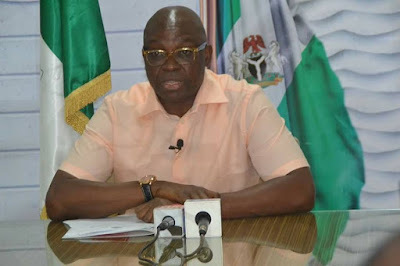 In a statement signed by his spokesperson, Lere Olayinka, on Wednesday, September 6, the Ekiti governor claimed the statistics upon which the claim was based is meaningless to Nigerians. He described the news of the country being out of recession as similar to that of when it was reported that the country had defeated Boko Haram. “Claiming that Nigeria is out of economic recession without any corresponding effect on the living condition of the people is just like they said Boko Haram had been defeated and over 400 people were killed by the insurgents in the last five months.” The governor also described the reason given for the cancellation of the Federal Executive Council meeting on Wednesday as funny. “If Nigeria is indeed out of economic recession, has price of foodstuffs like rice reduced to N7,000 per bag that it was when Buhari took over power? “Is dollar now N197 to $1? Is petrol now back to N87 per litre that Buhari met it in May 2015? Are Nigerians now feeding comfortably, even if it is once in a day? “Most importantly, are states now getting enough allocation from the federation account to be able to meet their obligations, especially payment of salary?” “It must be stated that Nigeria’s foreign reserves, which stood at $28.6 billion by May 2015 that President Buhari took over power declined steadily to $23.89 billion by the last quarter of 2016. It was in 2016 that Nigeria slipped into recession, owing to the bad economic policies and repressive actions of President Buhari “It is sad that the APC government has remained on the path of lies and propaganda and I wonder why the government can’t be truthful for once. “However, if this latest lie is about 2019 general elections, they have missed it because Nigerians can no longer be received by the APC lying government. “Nigerians should therefore disregard their lies and keep praying for God intervention in the affairs of the country. I 100% support him in this one. The stomach-infrastructure governor!! He must talk naaw. Speaking faith we are out recession in Jesus name but for the government to say we are out of recession and a position I rejected in a school for a year is still vacant because of no money then it is a pure black lie.